“Paddington (voiced by Ben Whishaw) loves his life with the Brown family. They in turn have accepted him as another member of their clan. Heck, so has the entire neighborhood, everyone from the forgetful Dr. Jafri (Sanjeev Bhaskar), to the bubbly Miss Kitts (Jessica Hynes), to the lonely Colonel Lancaster (Ben Miller), to the charming Mademoiselle Dubois (Marie-France Alvarez), to the gregarious Mr. Barnes (Robbie Gee) embracing the Peruvian bear as one of their own, imagining their daily lives without him impossible. But after a break-in at Mr. Gruber’s (Jim Broadbent) antique shop, former movie star turned neighborhood celebrity Phoenix Buchanan (Hugh Grant) claims to have witnessed Paddington robbing the store. With his paw prints everywhere and the bear freely admitting he was in Mr. Gruber’s place, stating under oath to have gone inside only after seeing another mysterious figure breaking in, the cranky Judge Gerald Biggleswade (Tom Conti) has no other choice but to send the Brown family’s furriest member to prison. 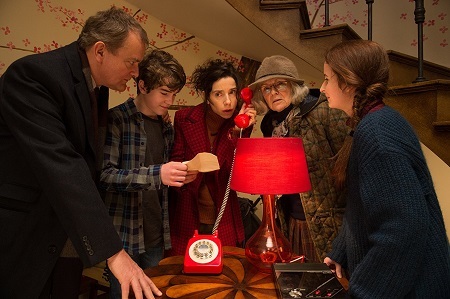 But while he attempts to make the best of what is undeniably a bad situation, Mary Brown (Sally Hawkins), her husband Henry (Hugh Bonneville), her mother Mrs. Bird (Julie Walters) and their children Judy (Madeleine Harris) and Jonathan (Samuel Joslin) will not rest until Paddington is free, investigating the crime for themselves and discovering the secretive Buchanan might not have been entirely truthful with his testimony during the trial. If 2014’s Paddington was a pleasantly heartfelt surprise that did real justice to author Michael Bond’s timeless stories featuring everyone’s favorite blue coat and red hat wearing bear, then Paddington 2 is an outright revelation. To put it more bluntly, this sequel is what The Godfather Part II is to The Godfather, what The Empire Strikes Back is to Star Wars, what Before Sunset is to Before Sunrise. It is an immediate, undeniably wonderful instant classic that starts off 2018 here in the United States on an endearingly enchanting high, and it’s hard to believe less than a dozen days into a new year I’ve already watched a motion picture I can honestly proclaim is worthy of being considered for my December top ten list, and we’ve still got roughly 50 weeks of movie watching left to go! I do have to say, ‘Here in the United States,’ because Paddington 2 did open in England to rave reviews last November. Not only that, it was recently nominated for BAFTA Awards (the British version of the Oscars) for Outstanding British Film of the Year, Best Adapted Screenplay and Best Supporting Actor for Hugh Grant. 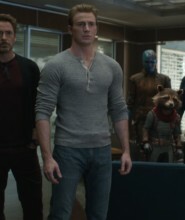 Even more importantly, it deserved all three noms. Returning writer/director Paul King and his entire creative team (most notably co-writer Simon Farnaby) outdo themselves with this sequel, filling the movie with so much intelligence, heart, whimsy, emotion and, most importantly, kindness watching it proves to be an absolute joy I didn’t want to see come to an end. Grant is having a blast as the flamboyant Phoenix Buchanan. But where he could have just decided to play things as over the top and as cartoonishly theatrical as humanly possible, instead the veteran actor chooses to give an actual bona fide performance. He infuses this nefarious villain of a thousand faces with a maniacally driven wherewithal that’s a continual delight. More, Grant shows an affinity and respect for the material, fitting right into the work King has so expertly constructed for him to be a part of with a determined enthusiasm that’s just plain marvelous. Of course, the same could also be said for the returning cast members, Hawkins, Bonneville, Walters, Harris and Joslin in particular. They are the Browns, the way they collectively show such genuine affection for Paddington, how they so selflessly welcome him into the center of their hearts with such festive grace, it’s all just so beguilingly authentic, each of them disappearing so completely it’s hard not to believe they’re a real family. I just adored the way they so altruistically rally to the bear’s defense, in the process showing the audience how to be better human beings just by accepting others for who they are and not expecting them to be anything else but that. The stuff in the prison feels like it was pulled out of some Wes Anderson stylishly imaginative fever-dream, the whole section a mad cross of Fantastic Mr. Fox, Moonrise Kingdom and The Grand Budapest Hotel. Yet King never loses the core sensibilities of Bond’s source material. In fact, the prison, thanks to some timely marmalade and a newfound yen for deliciously sugary pastry, becomes a candy-colored playground of pink pastels, flowery table settings and bite-sized teacakes. It all makes sense, and in this world where a talking Peruvian bear can make friends and become a valuable member of the community this is an important element that cannot be underappreciated. Paddington 2 is still the best film I’ve watched in 2018. Stop. Period. End of sentence. 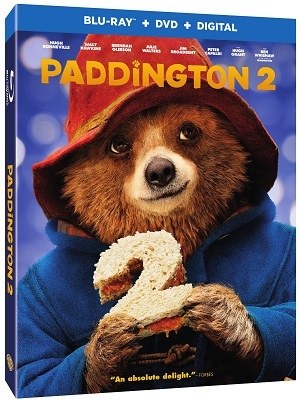 Paddington 2 is presented on a 50GB Blu-ray MPEG-4 AVC Video with a 2.39:1 1080p transfer. This Blu-ray features an English Dolby Atmos and Dolby TrueHD 7.1 soundtracks along with French, Spanish and English Dolby Digital 5.1 tracks and includes optional French, Spanish and English SDH subtitles. Audio Commentary with director and co-writer Paul King – Excellent audio commentary with King diving into all aspects of this sequel’s production. “Paddington: The Bear Truth” featurette – Mostly focusing on the themes of kindness, inclusion, family and community at the heart of the film, filmmakers and actors also take time to heap praise upon Ben Whishaw for his voicing of the iconic Peruvian bear. How to Make a Marmalade Sandwich – Yep. It’s a short on how to make a marmalade sandwich. What? Where you expecting something different? “Pit Pitty Pat” Music Video with Phoenix Buchanan – The closing prison-set musical numbers only as presented as a standalone music video. 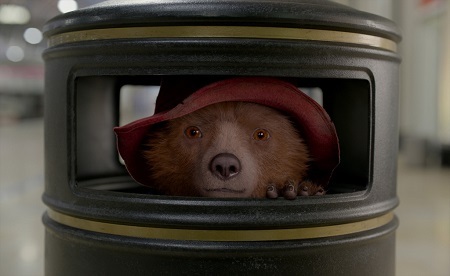 The Magical Mystery of Paddington’s Pop-Up Book – Much too brief short focused on the pop-up book so much of the film ends up revolving around. The Browns and Paddington: The Special Bond – Another brief featurette focusing on the actors who play the Brown family. Charming, but that’s about it. Knuckles: A Fist Full of Marmalade – Brendan Gleeson takes center stage, and the results are glorious. The Once Famous Faces of Phoenix Buchanan – Terrific little featurette focused on the costumes and makeup required to transform Hugh Grant into Phoenix Buchanan and his many guises. 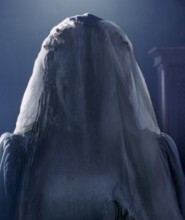 DVD and Digital HD copies of the film are also included with this release. I shall say it again: Paddington 2 is still the best film I’ve seen in 2018. Watch it at once. I have nothing additional to add.